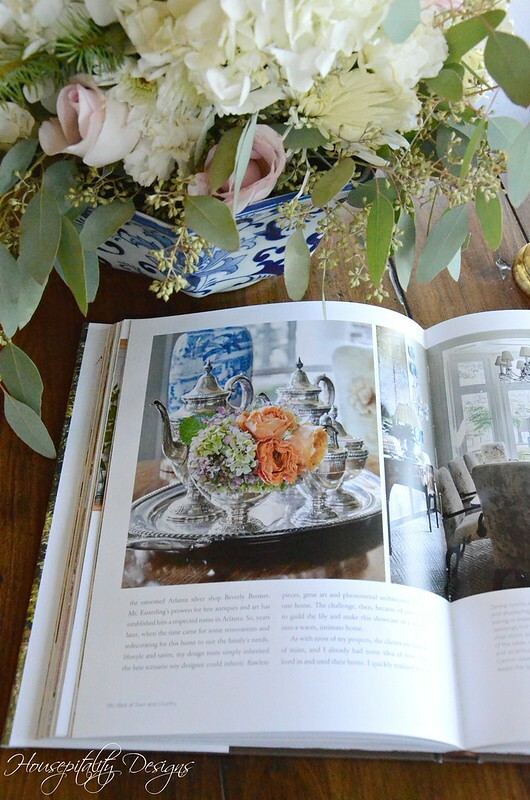 you know how much I love great interior design/home decor books. beautiful book filled with abundant inspiration. “A Place To Call Home, Timeless Southern Charm” by James T. Farmer, III. and this book certainly lives up to it’s title. It’s been a while, so it is indeed time for another Book Giveaway. My way of thanking my readers for your support and kindness! So here is a peek of A Place to Call Home – A Giveaway to start off the New Year. however, this particular image is from a home in St. Louis, MO. So even homes in the Midwest can truly have great Southern Charm! 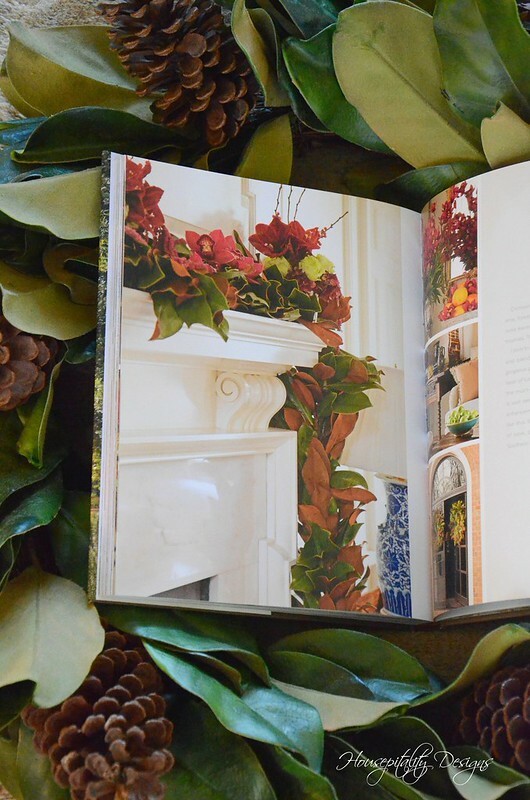 This book has it all from beautiful vignettes of floral arrangements. . .
of flowers and magnolias? Talk about Southern Charm. and the wonderful ways on how to display your pretties. Like in this amazing hutch! such as this cute front porch of a cabin that James T. Farmer decorated for his friends. So you could have a chance to be the lucky winner of this beautiful book. or a Mint Julep on Kentucky Derby Day! The Giveaway will end at Midnight, January 24th, 2018. Have a most beautiful day and hope that this book and giveaway made you smile! “Yes, Ma’am” and “Yes, Sir.” That’s what sets us apart. 🙂 I love how we show respect in this manner. I love that they preserve old homes in the south. The heritage that is past down thru generations to preserve these beautiful homes. The beautiful landscapes that are so beautiful surrounding the homes – the history is probably the most intriguing. There are so many things I love about the South. My favorite has to be sitting on my porch with a glass of ice cold Sweet Tea and reading my newest copy of Southern Living magazine. Relaxation at it’s best. I’m not sure if this is a Southern trait or thing 😉 But I love hearing a child talking to another adult and addressing them as “Miss” or “Mr”. My 38 year old son still addresses my friends from “back when” as Miss Margo or Miss Marian. I kinda think it’s a Southern thing and it makes my heart so happy. I love the stories that are handed down from generation to generation in the South, as well as the old photos that tell a story themselves. I love the traditions of learning how to be a lady and gentleman especially. I wish we had more emphasis on that but NOT to make women less assertive and stand up for themselves;) This looks like an amazing book and thanks for the chance! I love all the pictures you shared. Have a beautiful day. I am off to bowling. And guess what. I am having my house photographed tomorrow. Not for a magazine (I wish) but someone who has photography as a hobby and saw some of my Christmas online! I would love to win this beautiful book. Favorite southern thing….sitting on a rocking chair on the front porch drinking a glass of lemonade. I love that we feel it is important to be hospitable to others around us. I don’t live in the south but love visiting every year. My favorite thing is how polite people are. Not just those in positions where it would be expected but EVERYONE seems to have manners. You don’t see that everywhere. I love that we still remember our ancestors, still have our annual meetings at our family cemeteries with lunches and ‘singings’. I love that we still remember families when they lose loved ones, and with bridal and baby showers. My granddaughter just built a new home and she used a screen door from my mother’s old house for her pantry door. I am going to give her the old churn. Thank you for the chance to win…”Bless your little ole’ heart! Love the southern sayings. Our son lived in the south for a short time. When we would go visit him and his family we would spend a day checking out all the local antique shops. On one trip we were looking for a specific item. The shop didn’t have any but one other customer was in the shop and said he would go home and get what I wanted. No one has ever offered to do that for us before. True hospitality in the south for sure. My favorite thing is how us Southerns communicate with each other. When I recently met someone new she asked “Now, who were you?” Meaning, what is your maiden name. Love it! I love being called Miss Nancy even though I’ve been Mrs. Nancy for 54 years! When my doctors call me that, it just seems to add a more personal touch. Having spent most of my life in the south (Mississippi and Virginia), I would say it is the many little things I love. Friends are always welcome into ones home, there is always time to chat on the porch, everything is celebrated, the smell of the gardenias, and of course the food. There is a sweeter tone which greatly enhances ones daily life. Shirley, the book is a beautiful giveaway – so very kind of you. I love having my Tea parties with my granddaughters and daughter. I always use my mother’s fostoria to make it extra special. I love the common courtesies and politeness. Getting harder to find in the US, and I hope we dont lose our manners! So many favorite southern things – pearls, white gloves, magnolia, boiled peanuts, sweet tea, grits, monograms, cotton, peanuts in a coke, fireflies in a mason jar, I could go on and on. You can take me out of the south (he did) but I will always be southern. I love ALL things southern! My screened in porch, Mom’s silver service handed down to me and sitting on my sideboard…yes, I love polishing silver…beautiful warm southern evenings watching lightening bugs light up the back yard, iced tea, and country friend steak! My favorite southern custom is the gracious and welcoming attitude afforded guests – come on by and sit a spell! Well, since I was born in Memphis, Tennessee, spent my early childhood in Georgia, then Miami throughout school years and now living in Texas, I’m indeed a southern girl, with all the tradition of the south. I absolutely love all things southern,especially the beautiful homes with mahogany furnishing & the warmth of a traditional home. I also appreciate the culture, the respect & honored traditions passed down through generations. I am not from the south but I love visiting there. It’s the warm evenings and smell of flowers, and there is something very moving when visiting places with so much history. Shirley what a beautiful book. As a southerner nothing better then sitting on the front porch! The “Southern Hospitality” I have always experienced when I travel there. It’s not just when I walk into someone’s home, but also when I go into a place of business. You would think that when you go into a business that you would be treated well since they want/need customers, unfortunately, there are times when I am in other parts of the country I feel like turning right around a walking out. I’m happy to say I’ve never had that feeling when I have been in the south, instead I have been made to feel as thought I am being welcomed into their home. I love the Southern tradition of pass-along plants, such as crinum lilies. And you never say “thank you” for the plant or it won’t grow. You thank your friend or neighbor for their generosity. Thank you for a chance to win this lovely book, Shirley. Hi Shirley, you are so sweet to do a give a way for your followers. The book looks amazing I will have to check it out. I Love, love, love the pillow in the first pic. I have a thing for wildlife and especially deer. Where did you find it? Have a wonderful day! Joanne, that pillow was a Pottery Barn seasonal pillow that is not available now. Maybe they will bring it back next fall. It is a beauty! I have one and love it. 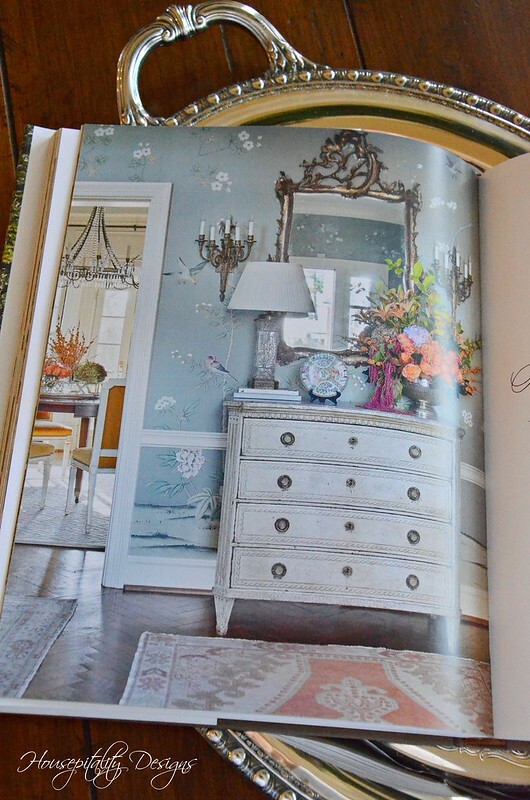 Beautiful book, love southern decor here in Virginia! I love the southern twang — gets me every time. I also love the sweet iced tea! Love grits and other southern food plus everyone is so friendly!! I am a Southern Belle! I was born and raised in the South and proud of it! I love sweet tea and banana pudding. Most of all, I love when you go to someone’s house, they always say, “Y’all come on in and let me get you something to drink.” I would be honored to have a book by James Farmer. I haven’t spent much time in the South, but I do like Southern food and decor. I now reside in California but lived in Raleigh, North Carolina, for over 12 years. Despite popular opinion, chivalry is still alive in the South and sets my hear aflutter! Additionally, I love the tradition of Sunday dinner which encourages families to cook and sit down to eat together. A couple of times a month I’d frequent an antique shop on Saturday mornings and got to know the owner fairly well. She never failed to ask if I had any suggestions of what to prepare for Sunday dinner….mind you, she was still lovingly doing so at the age of 96! Thank you for the opportunity to win this lovely book. I was born and raised in the south, and two of my favorite southern things are sweet tea and boiled peanuts. I feel that you won’t find any better people than Southern people. They are always ready to lend a helping hand, pray, or go the extra mile for anyone that needs help. My favorite things about the South are the beautiful landscapes, the beautiful towns like Knoxville and Nashville TN and the seasons we enjoy – thankfully never too extreme. I love your blog and would love to win this book. It looks like a keeper for sure. Happy New Year to you and your family. May it be one filled with fun surprises, happy days and good health! So many things. I spent summers in the South with my grandparents climbing trees, helping string the beans, canning, picking blackberries, climbing the apple trees…………. An elderly relative would make us fried tomatoes and biscuits with gravy for breakfast and then fried huckleberry pies. I ended up attending high school and college in NC and TN even though I lived in the North. I now live in the Northwest but will always have a special place in my heart for the South. I think for me, what I love best are the people! I find southerners are warm and friendly people, always willing to help, talk, wave and just be there for you, no strings attached. I love good, old southern cooking! Especially cornbread, greens, and beans. And yes, a cold class of sweet tea to go with it. HUGE James Farmer fan although I have not a single book of his! What I love about the South are the common courtesies and manners. And I have to mention that your pillow in one of your photos is gorgeous! Being raised in the north and moving south when I was eighteen I was surprised that strangers speak and say hello. Also, adjusted to saying y’all and referring to soda as coke. Love the south! fried okra, and mac and cheese! That’s the best part of living in Mississippi!!! Southern hospitality is the best. Although I always have to laugh when someone says “bless her heart” and shakes their head just a little. I love the south and everything about it. The southern cooking, politeness, traditions and the history. Especially family closeness. Hope you have a great day. Hi Shirley, A Place to Call Home was on my Christmas list but Santa did not bring my copy! So I would be thrilled to have this one on my coffee table. What’s not to love about the south? Fresh garden vegetables, fried chicken and cornbread will always be a winner for company dinner. Of course, one can not forget how much southerns love their favorite football team and tailgating. I never met a southern that did not love magnolias, azaleas and dogwoods. Every person should enjoy porch sitting in their life time. My favorite saying is hunky-dory, it means, everything is okay. Adore your blog. Many blessings for the New Year. I have not visited the Southern region of the U.S. for a long time. Your blog and the readers comments are an incentive to put it on my To Do Travel List. I was born and raised in the south and I am a true southern girl. I have a thick southern accent and call others Ya’ll. There’s something magical about the south! It’s as if we’ve never let go of the good Ole days! I love front-porch swings! Both my grandparents had them as well as my mom. As a child, I could swing forever and sing to the heavens….lol. Don’t see them much anymore. Seems like no one takes time to swing on the porch. Such a shame! I love everything southern. Some of my favorites are our manners, front porches, fried chicken, and southern blogs. one of my favorite things are good manners and once that is inbred you have them for life. I especially enjoy it when I hear my boys speak to others with respect . It makes you think that you probably did something right when you were raising them. I also love all the beautiful old homes in small towns across the south. Having lived all over the world as a military brat and then a military wife, i feel blessed to live in the south. When I was young and foolish,I couldn’t wait to get out and about. As an Army wife it was exciting to live in different places and explore! But then, a soul-deep longing stole its way into my heart…a longing for HOME. I wanted to go home where I felt I belonged,a kinship with people of soft words and accents,who understood me in ways hard to explain but deeply felt. There are so many things I love about the South and Southerners it’s hard to pick one. Sweet scents of magnolia and gardenias, soft breezes on a Summer night, watching those lightening bugs blinking their secret messages while sitting on the porch savoring mason jars of sweet tea and eating Southern Caviar (boiled peanuts, ha! )are just a few favorites that come to mind. I guess if I had to pick just one thing that is paramount, it would not be good things to eat (Lord knows we have a gracious plenty)or beautiful buildings and scenery (ditto)it would have to be the sense of family. You don’t have to be blood kin, no. You are one of us, we claim you, you are welcome, come sit down and set a spell. THAT is the South. I am a southerner so of course I love everything southern! The things I missed most when briefly living and vacationing was the sweet tea and food especially barbeque! Raised in New Orleans, spent 16 years in Birmingham, AL. Very proud Southern girl and would love to win the James Farmer book! Thank you for this chance at the giveaway, and thank you for a wonderful blog! There is just something magical about the South. I was blessed to attend a wedding in N.C. a few years ago (I’m from WA state). On the last day there, my friend and I drove around and enjoyed the many beautiful homes. However, I so enjoyed listening to people talk, weird, I know. There’s just something about mannerisms, accents, and charm of the South. Well I guess because I’m southern born I just love it!! I’ve traveled all over like NYC for Christmas but I was so glad to get back to the slow pace of life here in NC. It has always been a tradition for us to have a pigpickin every summer. Relatives, friends, their friends, neighbors and anyone that likes southern get togethers are welcome! Lots of fun with no alcohol. Just plenty of sweet tea!….and lemonade! Thanks for a win of this book! Hospitality in the south is something I cherish most..I’ve been a southern girl for 20 plus years after growing up in Pa. and I must confess, I don’t want to move back! We love SC living! Thanks Shirley for the book giveaway. Love your blog! Many things I love about the south and why I will never leave, but the thing I’m thinking of now was made famous by that great Southern lady Eugenia Thomas Duke. Yes, Dukes mayonnaise! Can’t make piemento cheese, deviled eggs or a good tomato sandwich without it! 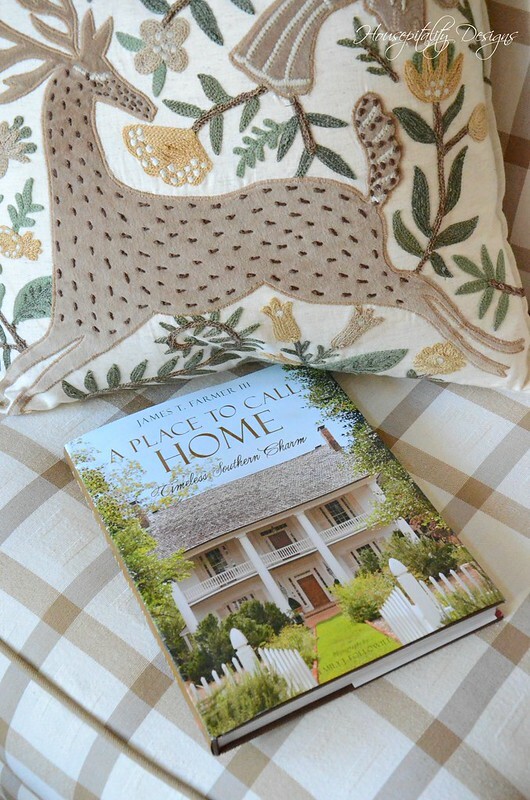 Would be delighted to won a copy of A Place to call Home! The many Southern foods my family incorporates into celebrations….boiled peanuts, barbecue, fried chicken, pimiento cheese, homemade peach ice cream. Born and raised in southern Missouri, there is so much I love about the south. We’ve retired in Florida but I remember one custom, in particular, of the drives on country roads where every one waves to you whether they know you or not! Sweet Home Alabama and Roll Tide! Can’t get more southern than this. Lived here in central Alabama all my life. Im loving this James Farmer book, there’s no place like home. My favorite southern thing is monograms. I love them on décor and clothing. Love your homeand your blog. My favorite southern pastime is sitting on the front porch with family and neighbors and watching the children playing kickball in the street. There is nothing more innocent and peaceful than to hear the adults talking about any and everything while the kids are playing without a care in the world. It’s been a very cold Southern winter thus far but the memories in our quiet neighborhood still linger to keep us hopeful and at peace. My favorite southern traditions are cheese straws and toasted pecans!!! My favorite food groups! What a beautiful and thoughtful gift you have chosen for a lucky reader. I LOVE THE SOUTHERN Hospitality! When our youngest started college…we dropped him off and headed to Savannah…my dream vacation. I love all things southern. I love the vignette and floral arrangements. What a beautiful book and way of living! Church ladies casseroles. Nothing better when you remember the ladies and their devotion and hospitality to others. That is the Southern way of caring. I love the vegetables -collard and turnip greens, rutabaga, fried green tomatoes, fried okra, butter beans,black eyed peas, yum! I would be honored to win a copy of this book! Shirley, My favorite Southern practice is the art of hospitality and the good manners practiced with the goal of never making another uncomfortable. Good manners and civility seem to fall by the wayside too easily, but I am always grateful when I witness true Southern hospitality! Shirley, James Farmer is a favorite of mine! I love all of his books! What a nice giveaway to a lucky reader! The South doesn’t have fire flies, they have lightin bugs! They love pearls, porches, peaches and peanuts. Their fried chicken is spectacular! Biscuits served with gravy, yum! and will always be her daddy’s little girl. The Southern charm is always gracious. A Place To Call Home! A rocking chair on the porch with the smell of gardenias nearby! Front porches with big ole rocking chairs to sit in while waving at your neighbors and drinking sweet tea! Love the historic homes and beautiful gardens. The beautiful homes, traditional decorating, porches, food, monograms and family time. The south is truly wonderful. I just love the beautiful neighborhoods filled with elegant homes and gorgeous gardens. I’m born and raised in Savannah. I love our accent and slightly slower pace of life here. Sweet tea is a must, plenty of ice, even in the winter. We say yes ma’am, no sir to all ages all our life. You’ll hear y’all all day long here. Magnolia trees, camillias, I could go on and on. It’s a special way of life here. My husband and I lived in upper east Tennessee for about a year and a half, many many years ago in the early years of our now 37 year marriage. In addition to the honesty and kindness of the people there I was most struck with the strong sense of honor in the family unit. Relationships with grandparents and aunts, uncles and cousins were well nutured and celebrated. Family history was an intergral part of who they were. Just recently I came to discover my own family genealogy and it reminded me of that same sense of family history I experiened back in Tennessee. Beautiful book and generous giveaway-thanks for this chance to participate! Southern Charm encompasses so many areas…southern hospitality, grace, respect, history, family ties, and everything genteel. I was born and reared in the South. Attending college also in the South, I met and fell in love with a Midwesterner. We lived in the Midwest for three years. We moved to my hometown in Coastal NC as soon as the blessing presented itself. My husband’s family soon followed, and we have all been as snug as a bug in a rug ever since. We enjoy traveling, but the South is heaven on earth for us! My fave southern thing is cornbread cooked in a skillet. Being a born and bred southerner (S.C.) now living in the Northeast, I carry on the “tradition” that my Momma taught me “Never leave the house without lipstick on!” You just aren’t fully dressed unless your lips are covered in color. Don’t know how that tradition came about, but I cannot recall a time I did not see even my grandmother without lipstick! My mother was a classy and proper dresser and I am thankful for all she taught me; even how you HAVE to send a handwritten thank you note to anyone that has given you a gift, visited or anything of that nature…its a southern thing! Thanks for giving me a chance to win the beautiful book! Love your blog! I love the gracious front porches on so many southern homes! 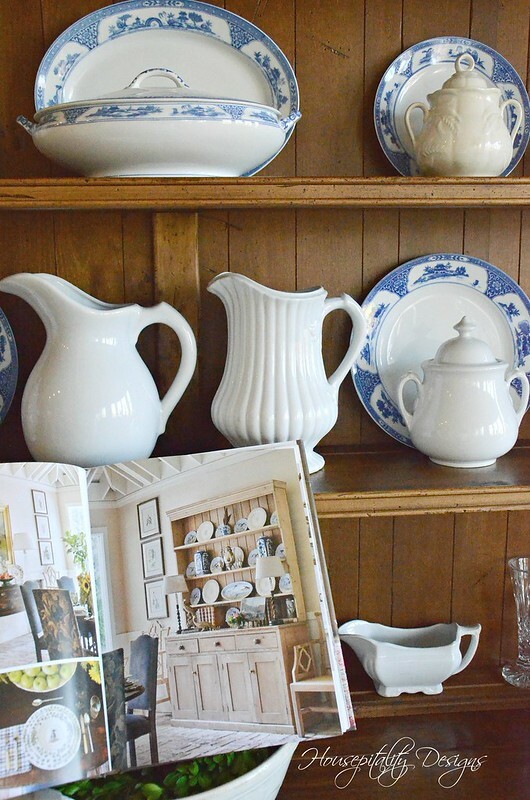 Born, raised, and still in the South…I cherish our “passed downs.” Furniture, recipes, linens, pearls, manners, plants, and even quirks tell stories of our past that resonate into the future. My young grandchildren are learning the stories of our “passed downs” and will use them as a touchstone throughout their lives. We all need to remember we are a small part of a much larger family. Stunning hats for the Derby. One of my favorite southern foods is Pecan Pie with a hot cup of coffee, enjoyed with family or dear friends. Good food is one of the many things I love about the south, shared with wonderful people! 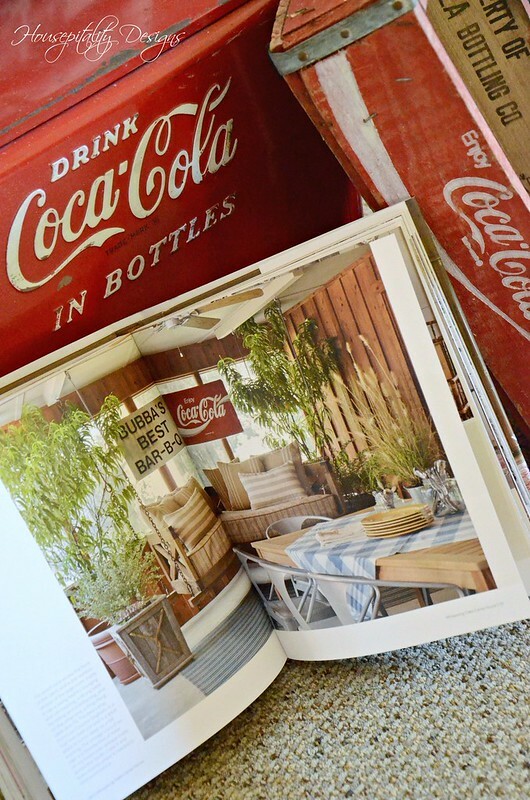 I enjoy seeing all the ways you refresh your home! Thank you Shirley for a chance to win this book! My favorite things about the south are fried green tomatoes and sweet tea! Shirley, I would love receiving this beautiful book. My home is very similar to yours except I don’t have as many porches as you do so you have given me tons of decorating ideas for several years. I am southern born and and have lived in the same beautiful area all my life. What I love most about the south is that most of us are friendly and are quick to help neighbors or others. My favorite southern food is fried green tomatoes cooked in bacon drippings served with sour cream. Gosh there are so many things I love about the south and being southern but some of my favorites are porch swings, Cheerwine, banana pudding, chicken and dumplings, blessing hearts and our accent. love me a worn leather chair and some worn in boots. I like the fact that in the South you really do not meet a stranger! In most circumstances folks will alway strike up a conversation and tell you all their troubles!!!!! Got to love the South! My favorite thing are the big southern porches that you can decorate just like a room. The book looks so inviting. Porches, sweet tea, Magnolia trees, Friends, southern style, and of course shrimp and grits! Magnolia leaves and they way you say Ma’am and Sir. I love all the Southern Food, Sweet Tea, Greens, Grits etc. Love the beautiful homes too. And it seems that Southern People are sweeter! I love reading your blog and wish I could buy your house! Adding it to my list of must haves. My favorite southern thing is listening to some New Orleans jazz on my front porch.